#MyInvisibleFight “How do you open yours?” – Living life the MegaSpecial way! If you know me, are close to me & think this will be too upsetting for you then stop reading now. 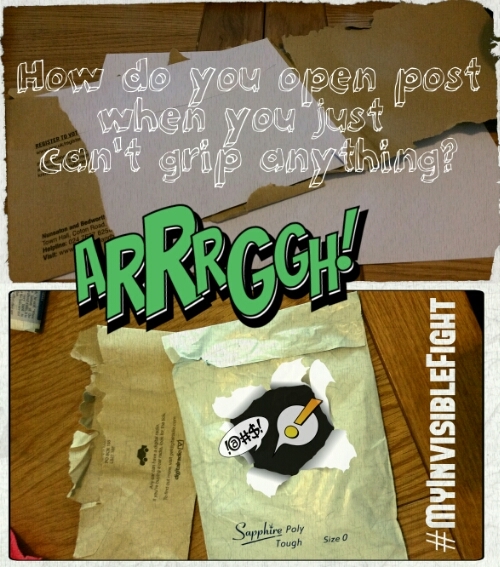 My 2nd photo is something as simple as opening the post! I love to receive mail! I no longer get bills in the post, come on people, we’re in the age of technology! Everything is now email, text, apps, this is our world! How exciting is it to hear the letter box rattle, knowing that someone somewhere has thought of you! Either that or its a flyer from the local takeaway! No thank you! We don’t want those here! Off I go to collect my mail, I sit down with whatever hot drink I’m partial to that day, post on the table in front of me & then I remember! Oh no, my hands aren’t working today! I can’t keep a tight grip of the letter & coordinate my other hand to work at the same time! Oh, oh…. no! I’ve torn it! I hope it’s still readable! Yes there is such a thing as ‘letter openers’ I’m just not sure it’s a good thing on days like these for me to be holding something with a pointy end! Imagine, gawd forbid if I ended up at A&E with a puncture wound somewhere on my body & having to explain to the nurse how I did it! I’m sure they’ve heard worse! Now please don’t stop sending me good old fashioned snail mail because I may not open it to perfection, where there’s a will there’s a way!